Blackheart Engineering has brought the guitarworld an amazing all-tube, vintage-styled BH5H head. The little guy has a 1×12 extension cab (BH112 cabinet) loaded with an Eminence speaker, a solid classically joined 15-ply (18mm) void free plywood cabinet box. The Blackheart is also available in a combo model (BH5-112). The little giant earned it’s reputation on sound, performance and raw attitude. It gets better, the price of the Blackheart’s Little Giant head (BH5H) retails for $199.99 at MusicianFriend.com. The Blackheart BH5H is a five-watt, single-ended Class A design powered by an EL84 and voiced through a single 12AX7 preamp tube. 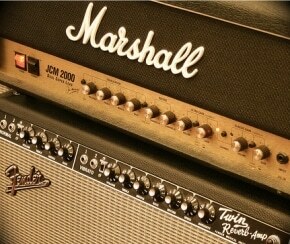 It incorporates a switchable pentode (5W) and triode (3W) selector and a three-band EQ (plus volume control). Guitarists get the ultimate amp in its class to deliver complete tonal range from instant punch to deliciously saturated overdrive, with flexible control over eq, tone and output volume. Every feature of the Blackheart Little Giant head represents passionate devotion to true quality in flexibility, tone, looks, and extreme ruggedness. Under its well-designed exterior chassis, guitarists will find a 16-gauge steel structure, 1/2-inch corner radiuses and detailed tolex work ensuring years of dependable performance. Other noteworthy BH5H features include: solid state rectifier, DC power to filaments for super quiet operation, 2W and 5W resistors in power supply, 2 oz. copper tracers and 1W resistors (carbon film) in signal path, double-sided PCB (for durability and to withstand handling for mods), 4, 8 and 16 ohm speaker outs and 15-ply (18mm) thick void-free plywood construction. As stated above, the Blackheart BH5H is built around a single 12-inch Blackheart by Eminence speaker in a 15-ply (18mm), classically joined, void-free plywood cabinet, the BH112 which sells for $159.99. This creates the ultimate half stack when paired with the Little Giant BH5H head. 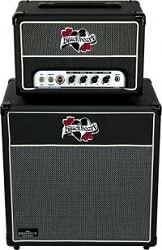 In fact, the Little Giant half stack (BH5HS) is available in the complete package at an amazing price of $349.99. The BH5-112 sports two parallel 16 Ohm speaker jacks and handles 75-watts (RMS) of power, the 1×12 cabinet can also be used to maximize the tone of other guitar amplifiers in guitarists’ arsenals. From its amazingly well crafted construction to its equally ultra-clean tolex craftsmanship, the BH112 is a great value in a portable yet powerful boutique-quality extension cabinet design. The BH112 closed back tuned design and Blackheart / Eminence speaker is the development of broad research involving Crate and Eminence speaker technology, and the result is a very responsive and tight speaker cabinet. Additionally, the BH112’s cabinet joinery is based on classic, proven design for maximum tone and rugged roadworthiness. Visit their official website for more information at www.blackhearteng.com.